Is debt Greece's biggest problem? At first glance, this seems like a silly question. No mention of Greece in the international press these days comes without the word debt lurking close by. Greek-style is to debt crisis what French-style is to surrender - the two phrases are inseparable. And yet, thinking about Greece along a singular axis - the ability to repay and reduce debt - is too narrow-minded. As the European Union steps up pressure on Greece to accelerate its debt reduction schedule, it should remember that there is more at stake that merely avoiding default. In fact, debt is a symptom that reflects Greece's underlying political and economic weaknesses - it is to resolving these weaknesses, not just paying down debt, that policy ought to focus on. Think about the following schematic of Greece's current situation. There are broadly speaking four possible outcomes for Greece: (a) the country fails to make significant reforms and defaults on its debt; (b) the country fails to make significant reforms but manages to avoid default as a result of more EU support with new loans and lower interest payments, or of easing of global financing conditions, etc. ; (c) the country makes significant reforms but time runs out and it ends up defaulting on its debt; (d) the country makes significant reforms and avoids default. There are at least two observations to make about these four outcomes: First, it is obvious that outcome (d) is the best of the four and outcome (a) is the worst, at least among those who have not shorted Greek bonds. Yet from a third-party perspective, it is not clear whether (b) or (c) is better. For the European Union, at least in the short to medium term, outcome (b) is preferable since the main problem for Europe is to avoid the run on debt that would result from any one Euro member collapsing. Limiting contagion is Europe's immediate goal. For Greeks, whether (b) or (c) is preferable depends on who you ask. Those Greeks who have benefited from the status quo (or the status quo ante) would prefer to see their privileges maintained as much as possible. For them, if the inconvenience of default could be avoided without changing how the country really works, this would be ideal. Public sector employees, several unions and professions in "closed" sectors (limited competition) fall into that category. The constituency that would prefer (c) to (b) is more limited. In the sense, these are the people who have either not benefited from the system or who are fed up by its shortcomings. These are the Greeks you can find in London, Boston and Brussels; the group includes youth and others who have been disenchanted by the lack of meritocracy and the dearth of opportunities; Greeks who think in national versus parochial interest are in this camp. The second observation to make about the outcomes is that while reform and the avoidance of default are correlated, they are not the same thing. In other words, while reform should help the country avoid default, it does not necessarily do so. Think about some extreme instances: say for example, that Greece decides to have a fire sale and manages to raise one or two hundred billion Euros by selling state property. By all measures, the infusion of cash would lower, if not eliminate, the chance of default. But this outcome entails no real political or economic reform. On the other extreme is a case where Greece institutes a flat 20% tax on personal and corporate income. This policy could be stimulating in the long-run, boosting investment and lessening tax evasion by simplifying the tax code. But the short-term effect on government revenues would be disastrous. Greece's odds of default would multiply, and the country is unlikely to survive unscathed to see the long-term effects of such policy. Obviously, these are extreme cases. For the most part, there is a virtuous cycle between reform and avoiding default: introducing competition, restricting the role of the state, enforcing tax laws, curbing corruption - all these are measures that deliver short- and long-term benefits. But the idea that reform and the avoidance of default is not the same thing is important to bear in mind, primarily because reform these days is intricately linked to pressure from abroad. Without the troika looking over the government's shoulder, the reform agenda would at best be shrunk, and at worst dropped altogether. This is Greece's fundamental issue: outside help is focused on the avoidance of default, whether with or without reforms (outcomes b or d). But for Greece, the best outcome is to make the country a better place to live; if default can be avoided along the way, so much better (outcomes c and d). And while everyone can more or less agree on the measures that would bring Greece towards (d) it is important to assess carefully whether measures are engineered to improve Greece's chances to pay back debt only or whether they are meant to make Greece a better place in the long run. As much as possible, the task for the Greek government will be to convince the troika to implement measures that are based on a strategy that goes beyond merely "avoid default" and actually addresses the underlying causes that got Greece in this mess to begin with. This is a very good blog. 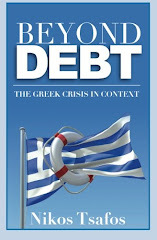 It contains some of the best articles and comments on the Greek crisis that I have read so far. I agree with most of what you say. It is a pity that few politicians seem to read it. Thank you for many well thought out articles. However it gives an impression that the main cause of the current crisis is only in the inefficient political process and the seeds of this has been sown during the 1980s. Since the lost 1980s Greece has been a major buyer of military arms every year. In fact I believe in 1998 Aki Tsochazopoulos had announced a $100billion military upgrade program over 10years. Just a superficial review of the past figures of say 4to 5% of GDP per year... this spending is at least responsible maybe 1/3(at least Euro100billion) of the current debt load. Assuming that this portion is a necessity Greece must budget maybe 10% to 20% of its current annual tax revenue to armament and another similar figure to interest payment. On its current Euro 50B of so of tax revenue...either this revenue has to increase or the non military/interest portion of expenditure must shrink or the interest/military portion must shrink. Its probably not impossible but for a government which has never had a balanced budget for a while...this is a task which requires undivided political will. great blog overall with very nice arguments. It is a pity that I found it accidentally. How about sending it to some other blogs in Greece as further links? Also, maybe changing the name? Default watch sounds like another cheap website on news about default; you are not doing that as you actually comment on various issues which go beyond watching when the default will happen. In any case, keep up the good work. In the ocean of corrupt media (mainly greek) which push Greece and Greeks to madness and default it is so refreshing to read a calm analysis.